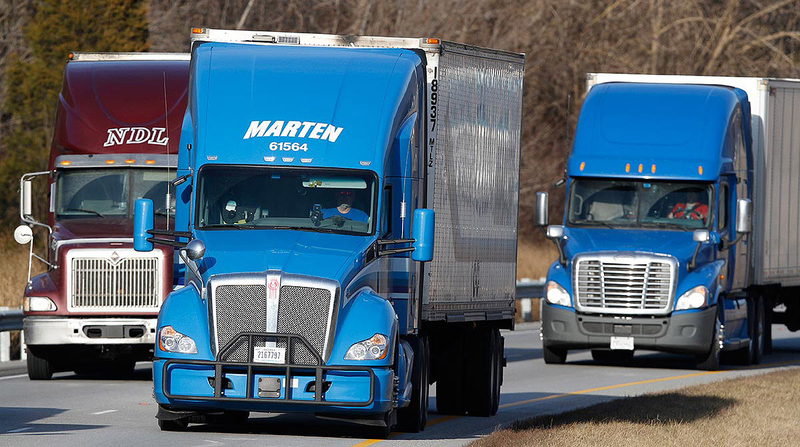 Marten Transport reported Jan. 25 net income of $8.6 million, or 16 cents per diluted share, for the fourth quarter of 2017. The results met the expectations of analysts surveyed by Bloomberg. Company results in the fourth quarter included a deferred income tax benefit of $56.5 million due to the change in U.S. federal tax code in December. When the benefit is included, Marten had net income of $65.1 million, or $1.18 per diluted share, in the fourth quarter. Operating revenue in the quarter rose to $182.8 million, beating the analysts’ expectation of $177.5 million, and up nearly 6% from $172.7 million in the fourth quarter a year ago. Marten operates four major segments — truckload, dedicated, intermodal and brokerage. In the fourth quarter, the truckload segment reported revenues of $97.6 million and operating income of $7 million, up 0.6% from the same period a year ago. The dedicated segment saw revenues of $42.9 million and operating income of $2.9 million, down nearly 35%. The intermodal segment had revenues of $22.4 million and operating income of $2.5 million, up 46%. The brokerage group had revenues of $19.8 million and operating income of $1.7 million, up nearly 48%. Operating revenue in the quarter rose to $182.8 million, beating the analysts’ expectation of $177.5 million. For the full year of 2017 Marten reported net income of $33.8 million and earnings per diluted share of 62 cents, meeting analyst expectations for both figures. When the deferred tax benefit for full year 2017 is included, Marten had net income of $90.3 million and earnings per diluted share of $1.65 for the year. Operating revenues for 2017 came in at $698.1 million, a 4% rise from 2016’s revenues, and topping analyst expectations of $692.8 million. For the year, operating income fell 4% for the truckload segment and 13% for the dedicated group and rose 16% for the intermodal unit and 23% for the brokerage unit. Mondovi, Wis.-based Marten is a temperature-sensitive truckload carrier specializing in food and other consumer packaged goods that require a temperature-controlled environment. Marten ranks No. 46 in Transport Topics top 100 for-hire carriers in North America.